Moleculera Labs, Inc. is a CLIA (Clinical Laboratory Improvement Amendments) certified clinical laboratory offering specialized testing services for autoimmune neurologic conditions. The Oklahoma City-based laboratory has received COLA (Commission on Laboratory Accreditation) accreditation, along with the Laboratory Excellence Award for their commitment to quality patient testing and laboratory practices. The company is authorized to receive physician test orders from all 50 states in the U.S.
Moleculera Labs is currently the only laboratory in the United States performing clinical testing with the Cunningham Panel™. This specialized testing panel aids clinicians in identifying infection-triggered autoimmune encephalopathies, including Pediatric Acute-onset Neuropsychiatric Syndrome (PANS) and Pediatric Autoimmune Neuropsychiatric Disorders Associated with Streptococcal infections (PANDAS). 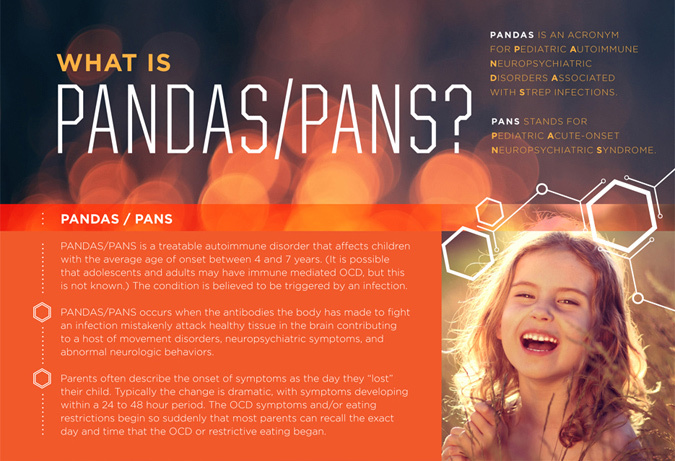 Patients with PANS or PANDAS have an onset of obsessive-compulsive behaviors, tics, ADHD, oppositional defiance, separation anxiety, anorexia and other neuropsychiatric presentations. The Cunningham Panel™ is the culmination of over a decade of research by Dr. Madeleine Cunningham and her team at the University of Oklahoma’s Health Sciences Center laboratory. The testing technology is exclusively licensed from the University of Oklahoma. The Cunningham Panel™ was made commercially available in April 2013.